It is with heavy heart , that we humbly request your prayers for our Friday Run Leader – Ahmad Zakir Jaafar who is now in a serious condition after being involved in an accident. Your prayers insyaallah will ease his pain and increase his chance to be on the road of recovery sooner. We pray that he will stay strong and positive and we will indeed going to miss his Friday runs which will be taken over by some of us. Our hearts go to you Zakir… semoga Allah melindungi dan mengasihani beliau. Ameen Yarabbil Alamin. 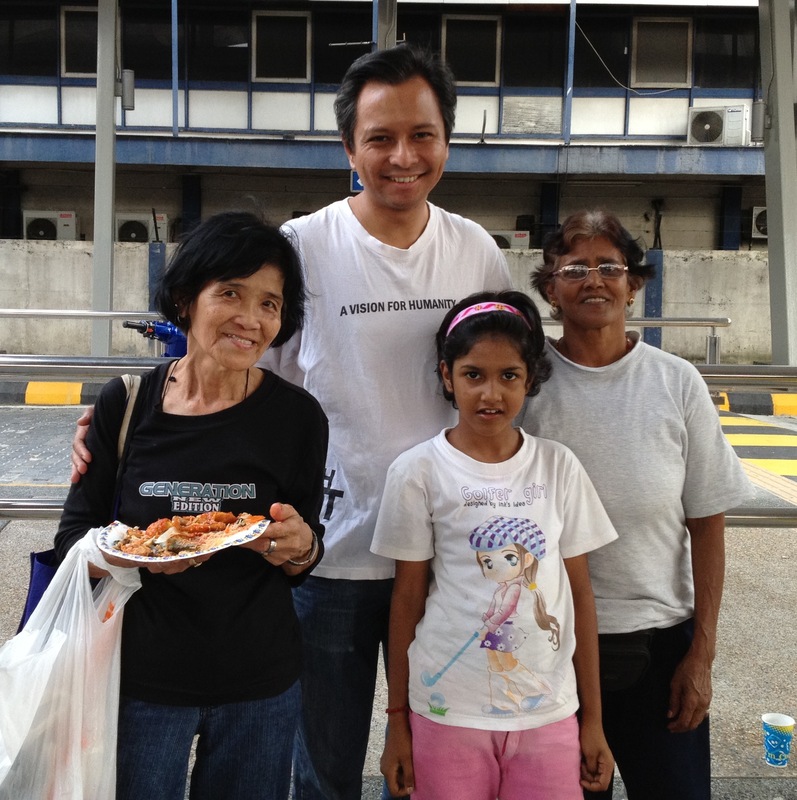 We had our Reach Out Raya Eid Mubarak Celebration with the homeless and the poor in the city of KL several days ago. Everyone had a good time and lots of people donated lots of food and goodies. We would like to thank those who made the event happened and those who had a hand for the items & foods given out to the poor and homeless. These are similar stories of two ladies both of their struggles & prayers to raise their loved ones. Tashna is 8 years old. She is in her standard 2 in her primary school. She is bright and full of spirit child. I have known Tashna and her grandmother since Tashna was 5 years old. I still remember the early days when both of them would walked for miles to get free food. Both of them are living in a rented DBKL apartment, rental of $500 per month. Her grandmother has odd jobs and been taking care of Tashna since birth. 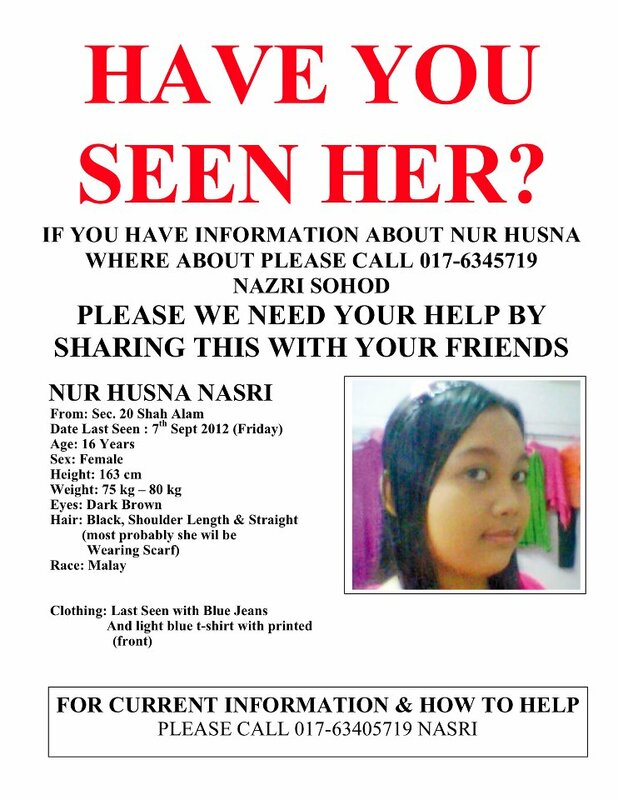 She is the only one to care for Tashna, send Tashna to school and to ensure Tashna has food daily. There has been many occasions when her grandmother has approached us for donations to buy school books & items for Tashna espcially beginning of school year. We even followed them to Tashna’s house and school to ensure books are bought. The grandma’s story is about the story of living on daily basis and ensuring Tashna will be a person who we all will be proud of one day. I know the grandmother will do anything possible, anything that is morally right, within her capacity to ensure that Tashna is alright. Also during the Reach Out Raya Eid Mubarak Celebration, Veronica told me how proud she is of her grown up children. I knew for several years that she has children of her own. Though heart wrenching I had heard several times before this when she told me her sons didn’t care for her and left her on her own. In order to survive she has been collecting empty cans from dustbins. Little did I know when she confessed to me that day she has been praying for her children all these years despite the mistreatment her children gave her. She never gave up raising her children even though the only she had were prayers for them. Nowadays she gets some money from her children to survive. I asked her why still collecting the cans. What she gets from collecting she will donate to the disabled beggars on the street of KL. She said to me “never stop praying Zakir”, after she only discovered of my recent divorced. “God will always be there for you” she added. Veronica is a story of how she survived throughout the years knowing her prayers are the only thing she can offer to raise her children. She was beaming with pride when she told me how her children have turned out despite of her years of picking cans on the street of KL. Veronica and Tashna’s grandmother have similar stories. Two ladies both of their struggles & prayers to raise their loved ones. Both with big hearts. 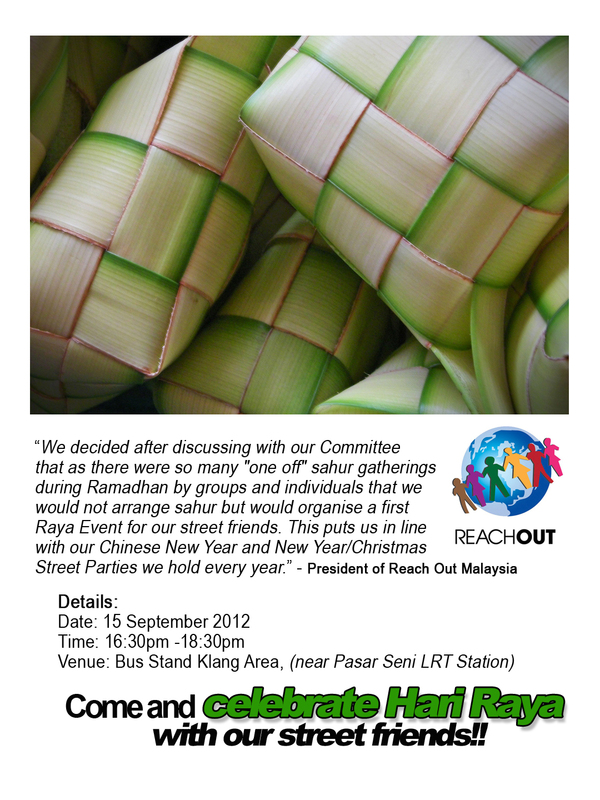 REACH OUT RAYA 2012 IS HERE AGAIN ! There will be no frills, no fancy hall, no status symbol, no red carpet! – but just a plain street Raya Party between our volunteers and streets friends! We will not differentiate anyone in anyway simply because we cant afford to! No racial and no religious barriers! Please do not tell us which political party you come from! Where? 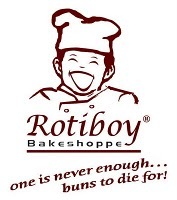 At our normal corner at ‘Bus Stand Klang’ – opposite of Central Market, KL (under the the LRT station) . 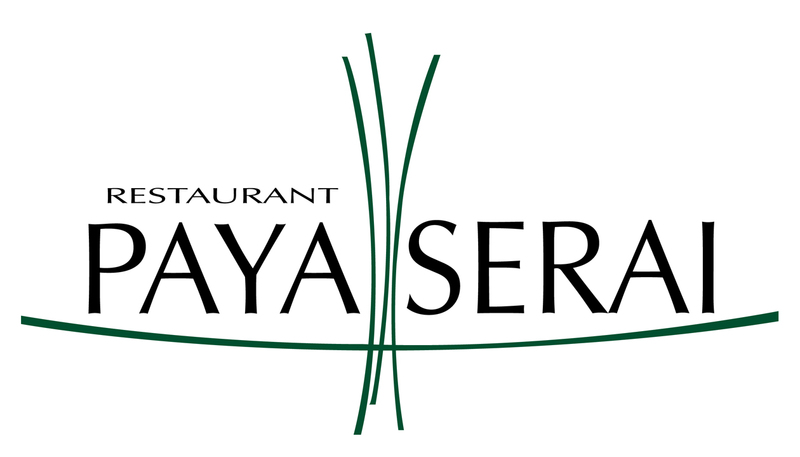 We are giving a treat of Raya Buffet to our street friends and Volunteers are most welcome to join in! Do join in the fun and please feel free to bring goodies, kuih, cookies etc to make the event a joyful one! WE HAVE NOTHING MUCH TO OFFER BUT WE PROMISE YOU PLENTY OF KINDNESS AND FRIENDSHIP – It is not difficult to please the homeless and Reach Out Malaysia. Just share your smile ! 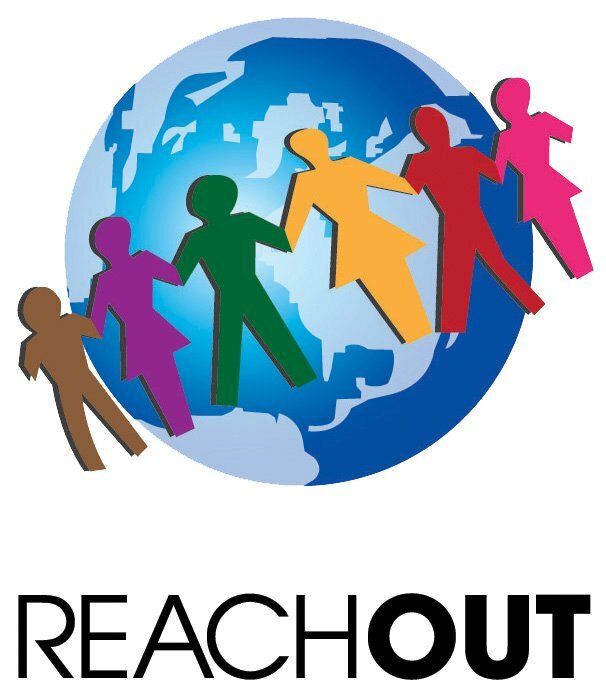 Reach Out would like to wish all of our Muslim volunteers, sponsors and supporters Ramadan Mubarak. 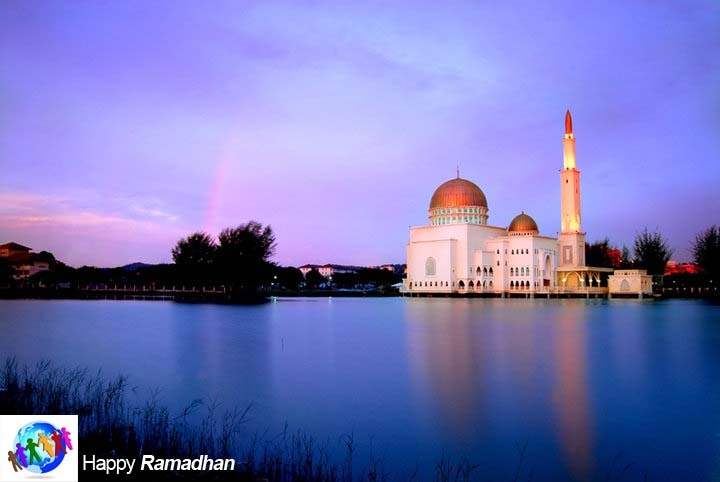 May Allah (SWT) bless your Ramadan and accept your fasts. As the Holy Month of Ramadhan is soon to be with us we need to make some minor adjustments to our programmes. For our 1st Run on Saturday we will now meet at 5.30pm instead of 5pm and commence food distribution at 6 to 6.15pm. That will ensure that all of our street friends will have food ready for breaking fast. All other runs will remain unchanged although some stops may need adjustment as we have many groups on the street distributing food. In order not to oversupply and see food wasted we will ensure areas that we know are not normally serviced by these groups will be taken care of. Some advice has already been given to our Run Leaders on this and they will use their discretion to ensure our food continues to get to those in need.